It’s the closest thing to free tuition cash out there. But schools and students have been hesitant to commit. Higher Ed Points, a startup from Toronto, is offering students a new way to pay for schooling — through everyday purchases. The year-old company is an exchange program allowing students at a participating university or college to crowdsource or pool Aeroplan points. In a couple of mouse clicks, 35,000 miles can become $250 toward school fees. It’s free for a school to join and Aeroplan got on board as part of an educational initiative. The program so far has 50 educational partners across the country, including Acadia University and the Nova Scotia Community College (NSCC). Reception of the program, though, has been mixed. It has just over 1,000 registered users, but not all have actively cashed in points. The average redemption is for $1,000 at a time, with the highest single redemption being $4,500. NSCC has been a partner since August 2014, but hasn’t had a single student user in that time. NSCC controller Glenda Barrett admits that they joined too late in the term for students to take full advantage of the program and are ramping up their advertising and marketing efforts for the current term. “It’s an attractive program for students and provided another opportunity for them to access higher education. It just makes sense,” Barrett said. Higher Ed approached the University of King’s College last year, but the school has been slow to commit. Sharlene Salter, Canada Student Loans contact for King’s, said they will look into the program more closely once the tax season wraps up. 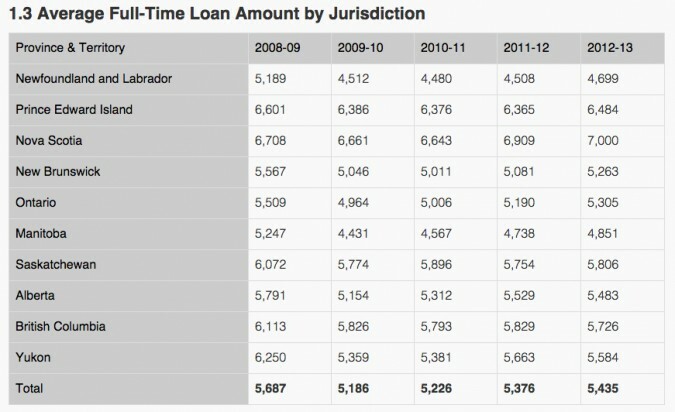 Courtesy of the Canada Student Loans Program Statistical Data 2012-2013. 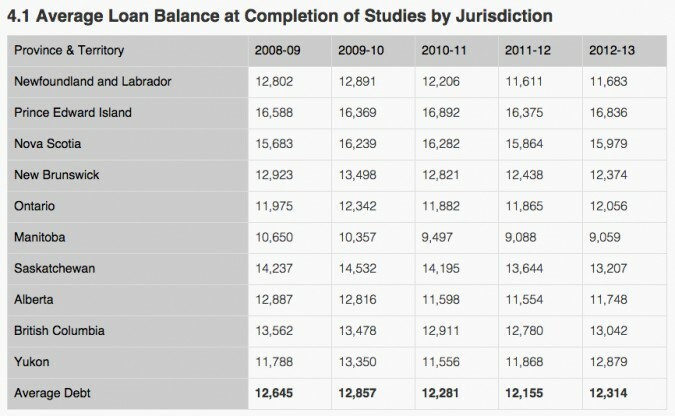 Post-secondary tuition is a contentious issue in Nova Scotia. The Canadian Centre for Policy Alternatives ranks Nova Scotia as the third most expensive province for tuition, with tuition rising in the province by three per cent each year since 2011. Later this month, the Nova Scotia Liberal government will reveal its plans for post-secondary funding for the 2015-2016 school year, which will have a direct impact on tuition fees. The Canadian Federation of Students – Nova Scotia has called for a delay until a post-secondary education review has concluded.